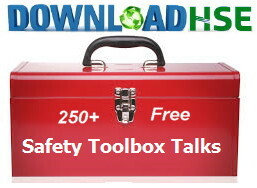 Please join DownloadHSE to receive over 250 FREE Toolbox Talks to be used for all types of Pre-Job Safety meetings. Below is an example of all the categories with hundreds of documents in the FREE Toolbox Talks links below. Download HSE offers FREE Safety Toolbox Talks for to assist safety professionals with topics at “tailgate” meetings. Return often and look for more resources as we continue to add to the FREE Safety collection. If you’re like so many companies these days, the daily safety meeting has proven very effective in reminding employees about the importance of safety in their daily tasks and in many cases it is now mandatory. “Toolbox Talks”, “Toolbox Topics” , “Safety Chats” , “Tailgate Meetings” or whatever your organization calls them is a brief safety talk or meeting about a specific subject at the beginning of the shift. These talks can be done in a variety of ways but are typically a brief (2-5 minute) interactive discussion meeting on something safety related. Toolbox Topics are used to cover a variety of short safety training subjects and to remind employees each day before they go to work, the importance of being safe. Need them fast… then download the Zip File at the end of each category. All documents are titled in a neat and organized folder ready for use and personal editing. Download… Un-Zip the files and enjoy! Feel free to contact us if there is a category or section that we might have overlooked and you would find helpful.